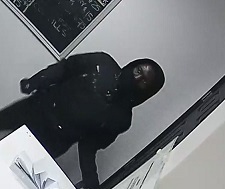 (Ottawa)— The Ottawa Police Service Robbery Unit has been investigating the recent robbery of a marijuana dispensary and is seeking the public’s assistance to identify the suspects responsible. At approximately 12:50 pm, on February 17, 2018, three suspects, all disguised, entered a marijuana dispensary situated along the 200 block of Montreal Road. One of the suspects jumped a counter, gained access to the employee area, and also then opened a door for one of the other suspects. The suspects made a demand for cash and related products. A struggle ensued between one of the suspects and a victim. A second victim tried to hide within the premise. During this time, one of the other two suspects discharged a firearm within the store. The projectile did not strike any person. The victim was then assaulted with the handgun. The suspects fled with a quantity of cash and related products, and were last seen running south on Lajoie St. The suspects may have fled the area in a dark colored vehicle, possibly similar to a Chrysler Sebring. The victim sustained serious injuries during the assault that necessitated transport to hospital, and later surgery. Police have obtained some images of the suspects and are releasing these to the public in an attempt to identify the suspects responsible. #1-Black male, approximately 5’9”-5’10” (175 cm – 178 cm), approximately 180 lbs (82 kg). At the time he wore a black jacket with red stripes (front and back), dark grey pants, white gloves, white running shoes, a black hooded jacket, and a light blue baseball cap. #2-Black male, approximately 5’10”-6’0” (178 cm – 183 cm), approximately 180-190lbs (82 kg – 86 kg). At the time he wore a black jacket with a hooded jacket underneath, grey jogging pants, black gloves, and black running (Adidas) shoe with white stripes. #3-Caucasian male, approximately 5’7”-5’9” (170 cm – 175 cm), approximately 190 lbs (86 kg). 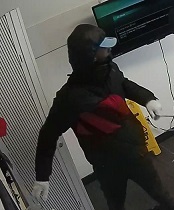 At the time he wore a black jacket with two front pockets (chest area), with a hooded jacket underneath, a black ski mask, black gloves with white or grey coloring around the wrist, black Adidas pants with white stripes, white running shoes (possibly Adidas).